I am restoring an Alvis Saracen 96 BA 69 but I would like to find out as much history of the vehicle including photos and making contact with those who used it in service. I have the record card and was wondering if anyone could help! 5th January 1956:	Date in service. No record – in storage? 6th July 1971:	17 Base Vehicle Depot (BVD), Recklinghausen, Germany (Stock). 10th February 1972:	17th / 21st Lancers, based at Northampton Barracks, Wolfenbuttel, Germany. 8th November 1976: 16th / 5th The Queen’s Royal Lancers, based at Northampton Barracks, Wolfenbuttel, Germany. 23rd January 1976:	Vehicle Depot (VD), based at Ludgershall, Wiltshire. 23rd June 1976:	34 Central Workshops, REME, based at Donnington, Shropshire. 23rd February 1977:	Vehicle Depot (VD), based at Ludgershall, Wiltshire. 14th August 1978:	Ordnance Depot, RAOC, based at Antwerp, Belgium. 12th February 1978:	Quartermaster (QM), Ordnance Depot, RAOC, based at Antwerp, Belgium. 8th June 1992:	Struck Off to William Banister, Northiam, East Sussex. Have you approached Home Headquarters The Queens Royal Lancers for information (by pure coincidence the 17/21st and 16/5th amalgamated a decade plus ago)? The only time I saw Saracens was in Ulster. Never saw any in BAOR. They were much quieter than and certainly much less draughty than Humber Pigs. Once saw a saracen based vehicle being used as a fire tender at Silverstone some years ago. Were there civilian versions I wonder. Most Gunner regiments had Saricans in the 60 and early 70 - they were used as Battery Command Posts prior to the issue of AFV 432. My first posting was to 22 sigs in Lippstadt circa 1965. Recce Troop was in it's 'infancy' and we had a motley assortment of vehicles including Austin Champs, Humber Pigs and Austin K9's. Gradually, we started to get decent kit and the Champs were replaced with series 2a LWB FFR Landrovers, The K9's disappeared and the Pigs were replaced with Saracens which some of us learned to drive. After the move to 7 Sigs ( 1967 I think) , the Saracens were upgraded to the Tall Command Post versions and kitted out with C42, C11 and Bid150. I loved the Saracen. It was fun ( but hard work sometimes) to drive but it was very noisy and we woke up a lot of sleeping civvies by roaring through their sleepy village in the wee small hours and kicking down to a low gear. The resulting scream woke up everyone for miles . A driver in 22 Sigs ( I think it was Jimmy Gray) kicked down once too often and blew the muffler off. ( What a clatter). Anyways, Recce Troop only ever had two Saracens, designated R1 ( Commanded by Cpl George Bates from Leamington Spa) and the backup was R2 Commanded by me ( L/Cpl Ian Beat). By 1968, the Saracens were replaced with FV432's which were still in service when I left in 1969..
Austin Champs had been replaced when I got in. Some of the 'old sweats' said they used to drag our Cents down to the washdown with them after exercises on Luneberg heath. , the Saracens were upgraded to the Tall Command Post versions and kitted out with C42, C11 and Bid150. We Gunners called them Saracens but strictly speaking they were "Armoured Command Post, RA". They were fun to drive but far too complex to maintain. I never knew that other units used them too, makes sense though. I'm struggling to believe that a Champ could pull a Centurion but I did bump start our fully-laden Bedford POL wagon with one once. BLUEBELL expressed much disapproval ! I just noticed this one Jim. I wonder if what you saw was that fire tender the RAF used. Would it have been called a Salamander ? 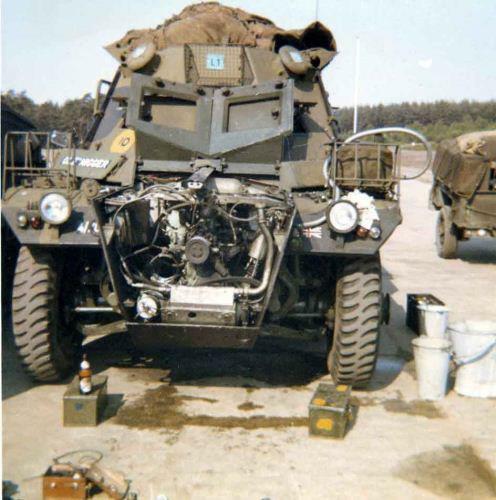 As previously stated the RA used them as command posts here is one I changed the engine on at Münsterlager in the mid '60's, belonged to 51 Kabul Bty. 24Msl Regt. My personal favourite was the Robert Radar which was a Radar FA9 mounted in/on a Saracen. I remember a drunken Gunner pinching it one night out of the Radar Park at Larkhill and hiding it on the ranges. Took us a couple to find it as it was all cammed up. mmmm, funny Shelldrake missed this one. Anyroad up. I'm trying to remember what the name of that beer is-the label looks familiar. Could it be Herrenhausen ? That'll be Left Sections CP? That Tac sign must've been introduced after the Great Exodus, in the mid 60s. While I was in 24 the CP was always "H". By the way Shelldrake, it seems to me that there should be a Gunner-related caption for your avatar. "Bad ram" springs to mind.